13 km from the capital of Himachal Pradesh, Shimla, the scenic hill resort getaway of Kufri makes a wonderful holiday getaway in the mountain hills. Far from the crowd that throngs Shimla, Kufri is a blissfully secluded hill station that captivates those who long for unhurried pace of life. Mahasu Peak, the highest point in Kurfi, is ideal for hiking through the thick wooded forests. From the temple on the top of the peak one can have a stunning view of the landscape. Located at an elevation of 2,600 metres, the Himalayan Nature Park, adjacent to the Indira Tourist, occupies 90 hectares of temperate vegetation that is home to a diverse fauna that are found in the higher reaches of the Himalayas. Some of the animals that are found in the park are Himalayan monal, leopard, musk deer, brown bear, black bear, sambhar, bharal, Tibetan wolf and Cheer pheasant. 3 km from Kufri, Fagu is a perfect place for spending a wonderful holiday far from the madding crowd. Life proceeds at a polite pace at this tiny village where you can enjoy leisurely walks amidst forests, potato fields and apple orchards. Located at an altitude of 2,509 meters, Fagu is home to the Hotel Peach Blossom which is run by Himachal Tourism and offers breathtaking views. An hour's drive though beautiful pine and oak forests will lead you to the quaint hill station of Chail nestled amidst towering deodar, conifer and pine forests and mist-soaked hills. Situated at a height of 2250 m on the spur of the Shivalik hills, Chial is home to interesting tourist attractions like Chail Palace, the Gurudwara Sahib, Kali ka Tibba, Siddh Baba ka Mandir, Chail Military School. 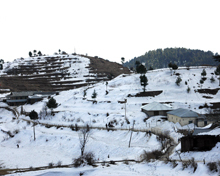 Chail is 26 km from Kufri. The nearest airport is at Jubbar-Hatti, 45 km away. The closest railhead is at Shimla, 22 km away. 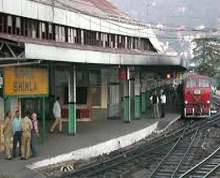 Shimla is connected to Kalka by an enchanting narrow gauge railway line. By road Chandigarh is 140 km and Delhi is at a distance of 395 km. From Delhi and Chandigarh, taxis and luxury coaches ply to Shimla. 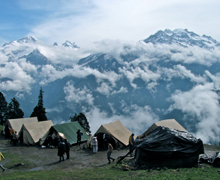 There are several accommodation options in Kufri to choose from. Whether you are visiting on a budget or want to enjoy the comforts of a luxury hotel with wonderful service, you can find accommodation to suit your taste. Hotel Wildflower Hall, Kufri Holiday Resort and Shilon Resort are some the famous hotels in Kufri.